London: A. W. Ridley & Co., 1926. 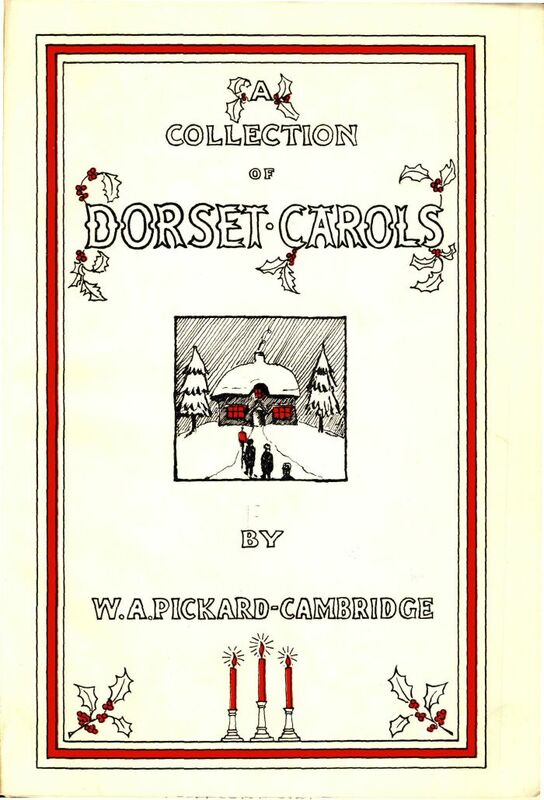 The following collection of Carols attempts to preserve, in a manner that may (it is hoped) commend them to educated choirs, some of the best of those which for at least a century and a quarter have been sung in Dorset villages, in the manner familiar to all readers of Thomas Hardy’s novels. The nucleus of the collection is a set of eight (Nos. 1—8) given to my father, late Rector of Bloxworth, by Mr. John Skinner, parish clerk for 62 years (1817—1879). Most of these have been regularly sung at Bloxworth every Christmas at least from early in the last century till to-day, for a long period by singers under Mr. Skinner’s direction going from house to house, and since his death at an annual carol-singing held for many years at the Rectory, then at the Church and now in the parish Hall. Kind friends in many villages in the central and southern area of the county, where a like custom prevailed, have enabled me to add substantially to this nucleus, by either singing or lending me manuscript copies of the carols known to them. To all of these I am most warmly grateful. Out of some hundreds of carols which I have been able to recover in this way, the following are those which seemed to be of most interest. The term “Dorset Carol” does not imply a Dorset origin: indeed, for the most part I have been unable to discover the authors of either words or tunes. Occasionally the manuscript books contain a heading like “Carol by James Tucker, 1827” (No. 12a), but without indication whether the ascription refers to words or to music. The words are all of the type familiar on the popular broadsheets of the later 18th and 19th centuries. Some are certainly drawn from well-known authors, e.g. : Nahum Tate (No. 12), Dr. Isaac Watts (Nos. 14 and 19 and part of Nos. 5, 23, and 27), Alex. Pope (part of No. 34): but in any sources to which I have had access most of them have been written or printed anonymously. Of two (Nos. 32 and 34), and of five others not here included, the first lines are given in W. Hone’s “Ancient Mysteries described” (1823), as already well known on the broadsheets of the time, with the remark that they “will at no distant period become obsolete, “showing (presumably) that they had already had a fairly long innings. Hone’s collection, which contained 89 such carols [see: Christmas Carols Now Annually Printed], would have been an invaluable help in determining the correct versions, but I do not know where, or whether, it now exists. Of the carols as here printed it is probable that many (as certainly some of those mentioned above) are of composite origin;, but no one who is familiar with either the old broadsheets or the human memory will be surprised if not infrequently a verse or half-verse of one carol pitches its tent in the middle of another. An editor must be content if the result he prints is reasonably coherent in itself. The tunes are largely of the type known as “Old Methodist.” Some few of them still appear (generally relegated to an appendix) in the hymn-books of Non-Conformist bodies, but most seem to have passed alike out of print (if they ever were printed) and out of use except as carol-tunes. Of these tunes, as of the words, I cannot say what proportion is of Dorset origin. The Samuel Wakely who is credited in the manuscript books with some of them (Nos. 8, 17 and 33), and with many others not here included, may probably have been one of the Wakely family whose descendants still flourish in the middle and west of the county; also No. 32 is described in a manuscript book as a “Carol by W. Townsend of Upway”: possibly Townsend, who certainly was not the author of the words, may have been the author of the tune. Otherwise such of the composers as I have been able to trace (see Nos. 2, 6, 7, 11, 12, 39) were not Dorset men. Of the settings here printed No. 30 is by Rev. S. S. Greatheed for the rest I am responsible. In some cases the extreme corruption, in others the relative dullness, of the harmonies as written in the manuscripts has compelled inc to re-write rather freely; but the result preserves, I hope, the spirit (to quote one of the carols themselves) of “joy and pious mirth” characteristic of our old country carollings. How wide a range of religious feeling that spirit includes will be evident to any one who peruses the carols themselves. If cheerfulness and a lively alertness are the prevailing moods, that is what should be: but the carols are ill-performed if such moods, however exultant, are ever made to appear lacking in their appropriate restraint; nor do they exclude—they merely set off—moods of sublime dignity (e.g. : Nos. 14, 23, 32) and devout tenderness (e.g. : Nos. 8, 25, 34, 40). May this edition help both to deepen and to widen the appreciation of the singularly healthy and (I believe) peculiarly English attitude towards Christmas and its story which the carols express. Worcester College, Oxford, 1926. W. A. Pickard-Cambridge.